Matt C: Knives were out for this movie almost as soon as it was announced. Josh Trank, straight from the success of the inventive superhero 'found footage' flick Chronicle, seemed like a smart choice for director, but the announcement of a young, fresh-faced cast seemed to start the ball of negativity rolling (even though it probably made some sort of commercial sense considering the success of the likes of The Hunger Games) and things kept on moving in the wrong direction from there. It was largely trivial, wrongheaded stuff, ranging from the controversial ("The Human Torch is black!") to the ridiculous ("The Thing isn't wearing any pants! "), with some dismissing it offhand before any official photos appeared, but things seemed to solidify more when rumours of tantrums and arguments behind the scenes (usually centred around Trank) began to creep out, giving the naysayers supposed vindication for their baseless criticisms. But where there's smoke there's usually fire, and while plenty of classic movies have withstood production difficulties to come safely through the other side, 20th Century Fox's decision to keep the film away from any type of audience (even the cast) until right before the release date seemed to indicate that something was rotten in the state of Denmark. The end result is not the unmitigated disaster some had decided months ago it would be, but nor is it particularly good - if anything, it's a muddled attempt to try something different with the property that goes horribly awry in the third act, with signs pointing to studio interference and a loss of nerve. In some ways, it seems to work best when it's not viewed as a Fanastic Four adaptation but as a YA sci-fi tale about a science-experiment-gone-wrong, because when it tries too hard to adapt the source material the results aren't especially positive. Although Tim Story's two Fantastic Four movies a decade ago are largely (and perhaps unfairly) maligned - thanks to their overall feeling of cheapness and flimsy characterization - they did a far better job of capturing the pop art charm of the Lee/Kirby originals (particularly the Thing/Torch dynamic), whereas here the attempt to get more grounded and gritty doesn't do it any favours in that respect. 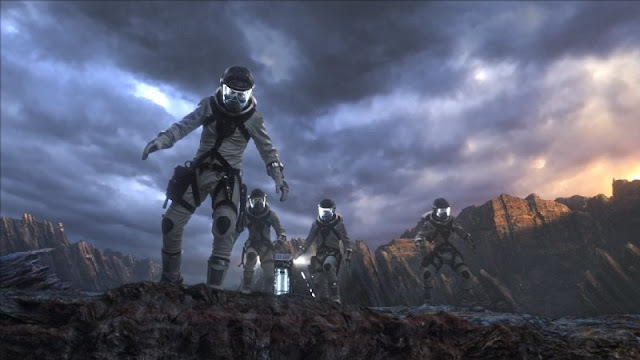 The opening of the movie is fairly clunky in the way it gets Reed Richards, Ben Grimm, Susan Storm and Johnny Storm together (as well as forcing Victor Von Doom into the mix). There's very little spark between the players which makes connection between film and audience difficult, although there's enough talent on screen to avoid total flatness. Where it does pick up is the the sequence where the decision to hijack the interdimensional pod and become the 'Neil Armstrongs' of a new era of interplanetary travel inevitably goes wrong. The visit itself is serviceable but it's the aftermath where the film actually becomes - albeit briefly - excellent, with the sheer panic and horror felt by the four as they discover the extent of their transformations becoming palpable. It's the moment when it looks like things are taking a turn for the better but, unfortunately, the exact opposite occurs. Without any inside knowledge of what happened behind the scenes during filming and post-production, any speculation here is purely guesswork, but the third act of the film feels like it was handled by a completely different creative team behind the camera. Character arcs are jettisoned, motivations forgotten, conflict discarded, believability lost, all in the rush to get the fledgling superheroes into a derivative, unimaginative slugfest with a woefully mishandled Victor Von Doom. Any goodwill generated through some of the aspects that worked up to that point disintegrate almost instantaneously as things stumble towards an illogical ending. It's a shame that it all comes crashing down because that obviously clouds the judgement of what's come before. Not that it is all uniformly superior up to that point though. There are problems with the casting, but a lot of this is down to script and story choices rather than the performers themselves. 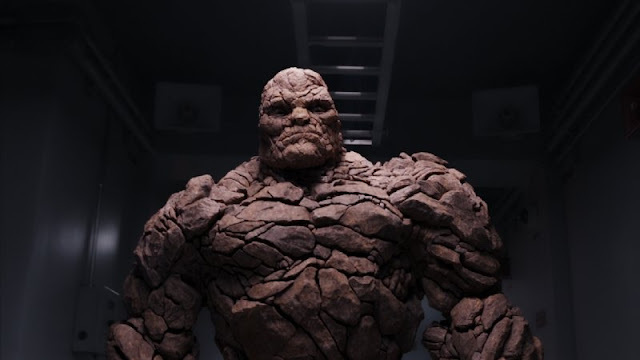 Jamie Bell is the worst off - he doesn't have much to work with as a one-note Ben Grimm, and even less as the Thing, the sad clown of the comics nowhere to be seen. Michael B. Jordan looked like he would come out best as the Torch, but he's cocky without the required likeability, a combination that Chris Evans made look easy in the previous incarnation. Toby Kebbell as Doom doesn't get any concrete motivation to provide real insight into what makes him tick, and he's devolved into 'generic baddie' mode by the end. Kate Mara is fine, but again, motivation is lacking. Reg E. Cathey as Franklin Storm (Sue and Johnny's daddy) makes a lot more impact than the aforementioned, and comes the closest to adding some emotional weight to the proceedings (and actually sounds like it should been him voicing the Thing!). Miles Teller, as Reed Richards, is clearly the central role here, which makes a lot of sense, and he probably comes off best as the overlooked genius who finally gets a chance to make a difference... until the third act, that is, when it seems as though someone told him he should start hamming things up as much as possible. 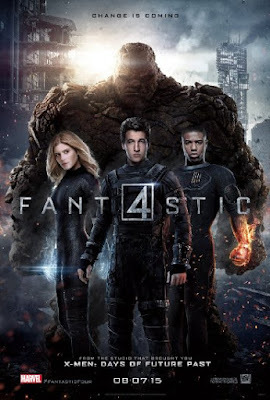 Having just seen this film today I have but one question,"What the hell were they thinking when they put this film together",this version makes the failed Roger Corman film of the 90's look good,can Fox please just hand back the film rights to Marvel so they can do it right and then maybe we can have our beloved Fantastic Four comic back and Marvel can stop trying to ram the Inhumans down our throats.